In Our Lifeline Group, love you all, we learned a wonderful acronym from a caregiver group. 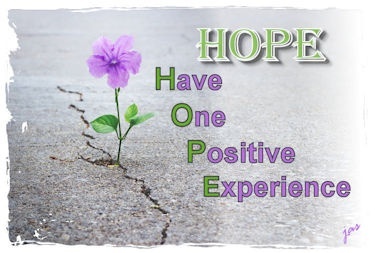 HOPE, Have One Positive Experience. So, https://uploads.disquscdn.com/images/5b5ec5abb0e7183ff429006e7d91b97f5b85fbe5a8219a483aff89d83308af86.jpg I did this for you. Your comments are appreciated, Kae. Warmest regards.